Hysterectomy is defined as a surgical procedure where there is complete or partial removal of the uterus (bag like expandable organ which bears the fetus during pregnancy) with or without the other organs of the female genital tract. Hysterotomy is a surgical procedure where an incision is taken on the uterus during any operative procedure in which the uterus is being operated upon. Hysterotomy is also known as uterotomy. Hysterotomy may be a part of the hysterectomy operation. Complete hysterectomy involves removal of the uterus along with other organs of the female genital tract like the ovaries, fallopian tubes and the cervix. In a partial hysterectomy, there is removal of the uterus alone leaving behind the fallopian tubes and the ovaries. Hysterectomy can be abdominal or vaginal, depending upon how the uterus is removed. A hysterotomy is compulsorily abdominal as an incision cannot be taken on the uterus by approaching from the vaginal end. Indications for conducting a hysterectomy are cancerous metastatic growths on any part of the female genital tract which pose a threat to the health of the woman. Certain fibroid growths which do not respond to conservative or medical line of treatment might have to be treated with operative procedures like a hysterectomy. In other conditions like a vaginal prolapse (collapse of vaginal canal due to relaxation of muscles), uterine prolapse, endometriosis (thickening of the uterine lining leading to menstrual troubles) too, a hysterectomy might be needed in extreme conditions. Hysterotomy is always performed under general anesthesia and is done to access the uterus or the fetus inside it. The incision taken for hysterotomy is much smaller as against incision taken for hysterectomy. If any corrective measures are to be taken for the fetus then this operation is done much in advance before the fetus is to be delivered. Hysterotomy is the choice of operation done for open fetal surgery. If the uterus is to be operated upon during a pregnancy, a hysterotomy is performed. Many a times a woman decides to get the fetus aborted post the first trimester and this is a very critical situation. Hysterotomy is the exclusive choice of operation in such cases. It is exactly the same like a cesarean section operation, the only difference being the intention of the operation. In hysterotomy, the intention is to bring about abortion whereas in cesarean section the intention is to bring to world a live child. There is lot of risk and potential complications in a hysterotomy but it is the last resort in a delayed abortion. Complications are always potential in such major operative procedures. One of the most common and the worst complications is onset of premature labor due to an incision taken at the lower abdomen which creates a stimulus for initiation of labor. If the uterine contractions are not inhibited then the contractions will end up in a premature labor. The other adverse effect of this procedure is excessive bleeding leading to hemorrhage and shock like situation. Side effects of hysterectomy are numerous too. If it is performed on a young individual then there might be symptoms seen during menopause e.g. brittleness of bones leading to osteoporosis. Hysterotomy is a surgery which is almost the same as a cesarean section. It is the incision taken on the uterus for any operation whereas hysterectomy is the operation done for removal of the uterus. Both are major surgical procedures and involve a lot of possible complications which can be avoided under skilled surgical hands. rachita. 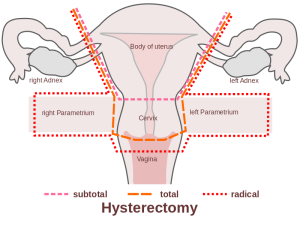 "Difference between Hysterectomy and Hysterotomy." DifferenceBetween.net. August 8, 2014 < http://www.differencebetween.net/science/health/difference-between-hysterectomy-and-hysterotomy/ >. Hysterotomy is a procedure which is performed before the 28th week of pregnancy when differentistion of the two segments of the uterus is not appreciable whereas caesserian section is performed after the 28th week when one can differentiate the two segments of the uterus.